Lehigh River veteran fishing guide Paul Davidson looked at the sky and warned us. Citing a high sun, clear water and substantial heat he expected a slow bite. In fact, he said we’d be fortunate to land a few fish. Despite the conditions we were in town to show Davidson (and many others) how well Pautzke Balls O Fire salmon eggs worked and welcomed the conditions. We hopped in Davidson’s drift boat and floated the river near Bowmansville. While the bite wasn’t lights out action on the eggs proved to be worth our time. It’s one of the few places in Pennsylvania that doesn’t get gutted within a day or two of stocking and supports trophy trout all year. The Lehigh River is one of Eastern Pennsylvania’s more popular and well-known fisheries. It’s also supports trout year-round. This section, however, isn’t stocked by the Pennsylvania Fish & Boat Commission. But, we did catch a few small planters the PAFBC stocked upriver that had migrated into the large holes we focused on. Most of the trout are rainbows and browns, some upwards of 10 pounds. We weren’t in the business of catching state stocked planters. The Lehigh benefits from private plants courtesy of the Lehigh River Stocking Association. The association is famous for planting trophy rainbows and browns. While the association plants more than 25 miles of river many of the trout carryover annually. Without their stockings there likely would only be a few trout in the lower stretch of river. They bring a positive influence on the river and work to maintain a destination fishery all year. I didn’t make a single cast, but had Kyle McClelland of XXL Chrome Chasing aboard to film Pautzke Outdoors. He didn’t waste time catching trout and succeeded in catching a few rainbows and browns to five pounds. In fact, in the mile-long drift we focused on we caught quality trout (and a few 12-inch planters) in every run/hole we drifted eggs through. Davidson spent time casting his favorite Rapala for large browns, but didn’t get any takers. Meanwhile, as soon as he switched to eggs he boated a large rainbow (one so stout he even got excited). Both only pitched a few eggs, most notably Gold Label, Natural Deluxe and Pink Shrimp. We’re sure our other eggs would have worked too, but bites came so frequently on these there was no reason to switch. The Lehigh sports clear water. Due to this we had to use four-pound test or risk fewer bites. Beyond that a few split shots, a float (to keep the eggs free flowing into the river) and size 10-16 Eagle Claw Lazer Sharp hooks was all we needed. 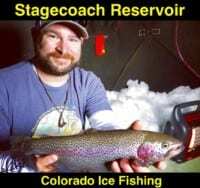 Keep in mind the Lehigh is a tailwater fishery that’s supported by cold, dam fed water. Still most of the trout can be found on seam lines, in deeper holes and on the edge of tailouts. Action continues to be good on the Lehigh even in the summer heat. One key to success is fishing early and late in the day when light penetration is at a minimal. Davidson believes trophy fish will be caught daily and when they are we’d all appreciate them be released. It’s imperative for a healthy year-round fishery. Editor’s Note: Paul Davidson operates Skinner’s Guide Service. For more information on his guided Lehigh River float trips please visit http://lehighriverfishingtours.com. To join the Lehigh River Stocking Association and bring more trophy trout to the system please visit https://www.facebook.com/Lehigh-River-Stocking-Association-110789772286943/timeline. For info on fishing the Lehigh River please visit the PAFBC at http://www.fish.state.pa.us/trout.htm.